Nationals Park is the site of the matchup between the New York Mets and the Washington Nationals on Sunday, August 27, 2017. The probable starting pitchers are Tommy Milone for the Mets and Tanner Roark for the Nationals. New York opens at +172 while Washington opens at -187. The Mets have a 69-47-11 over/under record and a 55-72-0 run line mark. The Nationals are 63-63-0 against the run line and have a 57-63-6 over/under record. The Mets have a 56-71 overall record this season. Starting pitcher Tommy Milone has a 1-3 record with an earned run average of 8.12 and a WHIP of 1.67. He has 33 strikeouts over his 37.2 innings pitched and he's given up 53 hits. He allows 12.7 hits per 9 innings and he has a FIP of 6.66. The bullpen has an earned run average of 4.38 and they have given up 425 base hits on the year. Teams are hitting .251 against the bullpen and they've struck out 467 hitters and walked 196 batters. As a team, New York allows 9.5 hits per nine innings while striking out 8.7 batters per nine innings. They are 26th in the league in team earned run average at 4.8. The Mets pitchers collectively have given up 1,184 base hits and 600 earned runs. They have allowed 175 home runs this season, ranking them 8th in the league. New York as a pitching staff has walked 451 batters and struck out 1,094. They have walked 3.6 men per 9 innings while striking out 8.7 per 9. They have a team WHIP of 1.45 and their FIP as a unit is 4.53. As a team New York is hitting .247, good for 23rd in the league. The Mets hold a .439 team slugging percentage and an on-base percentage of .315, which is good for 25th in baseball. They rank 23rd in MLB with 8.4 hits per game. 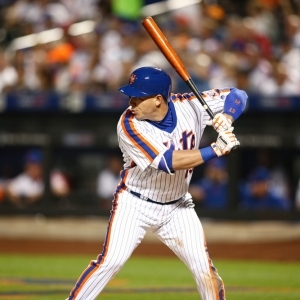 Asdrubal Cabrera is hitting .253 with an on-base percentage of .325. He has 93 hits this season in 367 at bats with 35 runs batted in. He has a slugging percentage of .381 and an OPS+ of 85. Jay Bruce is hitting .267 this year and he has an on-base percentage of .332. He has totaled 123 hits and he has driven in 88 men in 461 at bats. His OPS+ is 122 while his slugging percentage is at .536. The Mets have 1,061 hits, including 217 doubles and 188 home runs. New York has walked 403 times so far this season and they have struck out 1,009 times as a unit. They have left 829 men on base and have a team OPS of .754. They score 4.61 runs per contest and have scored a total of 581 runs this year. Washington has a 76-50 overall mark this year. With an earned run average of 4.64, Tanner Roark has a 10-8 record and a 1.36 WHIP. He has 122 strikeouts over the 143.2 innings he's pitched. He's also given up 141 hits. He allows 8.8 hits per nine innings and his FIP stands at 4.29. The bullpen has an earned run average of 4.79 and they have given up 361 base hits on the year. Teams are hitting .256 against the Nationals bullpen. Their relievers have struck out 347 batters and walked 132 opposing hitters. As a team, Washington allows 8.1 hits per nine innings while striking out 9.1 batters per nine innings. They are 6th in the league in team earned run average at 3.91. The Nationals pitchers as a team have surrendered 1,007 base knocks and 486 earned runs this season. They have given up 154 home runs this year, which ranks 18th in Major League Baseball. Washington as a staff has walked 385 hitters and struck out 1,127 batters. They give up a walk 3.1 times per 9 innings while they strike out 9.1 per 9. Their team WHIP is 1.24 while their FIP as a staff is 4.04. As a team, they are batting .269, good for 3rd in the league. The Nationals hold a .460 team slugging percentage and an on-base percentage of .334, which is good for 8th in baseball. They rank 3rd in MLB with 9.3 hits per contest. Daniel Murphy comes into this matchup batting .320 with an OBP of .375. He has 140 hits this year along with 81 RBI in 437 AB's. He maintains a slugging percentage of .549 with an OPS+ of 135. Ryan Zimmerman is hitting .300 this season and he has an OBP of .351. He has collected 127 hits in 424 at bats while driving in 86 runs. He has an OPS+ of 132 and a slugging percentage of .568. The Nationals as a unit have 1,165 base hits, including 248 doubles and 179 homers. Washington has walked 421 times this year and they have struck out on 1,004 occasions. They have had 856 men left on base and have an OPS of .794. They have scored 5.26 runs per game and totaled 657 runs this season.